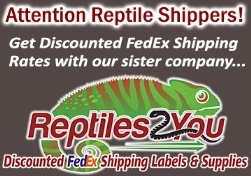 DUBIAS ARE ILLEGAL IN FLORIDA AND HAWAII - DO NOT ORDER DUBIAS IF YOU LIVE IN FL OR HI - WE WILL NOT SHIP! These SMALL dubia roaches are about 3/8" long. So when you order "100", we actually give you 12 ml, which will be approximately 100 roaches. 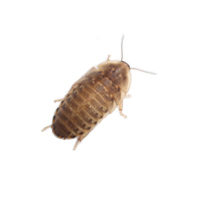 Dubia roaches (Blaptica dubia) are native to Central and South America, and have gained popularity as an alternative feeder insect in recent years. Supplementing your animal's normal diet of crickets and worms with occasional dubias is a great way to provide needed nutrients while giving them a good variety in their diet. • They don’t jump or fly - sub-adult dubias (like these smalls) have no wings. (ADULT males do have wings and are able to briefly hover & even glide, but they can’t gain altitude so they typically don’t try to escape from their containers). • They are relatively slow crawlers making them easy for your animal (and you!) to catch. • They cannot climb slick surfaces, which minimizes the risk of escapees and also helps keep them in food dish making easy prey for your animals. • Great nutritional value for your reptile. • Easy to maintain. They live very well, and eat a wide variety of fruits/vegetables/grains. • They don't make any noise. • Hardy, live well - can live for a year or more!